Decision time: “I would like to couple up with this person because we want the same things and although many people wouldn’t put us together, I think we could work really well and have a profitable future together; the person I would like to couple up with is...Sales”. Sales and marketing in a relationship? The nation is in shock! Ok, I’ll stop with the Love Island analogy, but the nation is gripped by these oily, tanned, body-perfect 20 year olds, when actually anyone in business should be looking at a more important relationship right under their noses. Sales and Marketing. I read a stat last week that blew my mind…”wasted marketing efforts due to misalignment between marketing and sales costs $1 trillion a year”. ONE TRILLION DOLLARS! Isn’t that a made-up number?! I bet there are numerous CFOs who wish it was, but with that sort of loss surely more efforts need to be spent educating companies and working to ensure their sales and marketing teams are fully aligned. Hubspot recently released their 2018 State of Inbound report and I discussed some of their findings in a previous blog (check it out – you’ll be very impressed with my grammar). One of the stand out points was that 75% of companies wanted to close more deals, but only 48% prioritised the efficiency of the sales funnel. Creating a more efficient sales and marketing process would without doubt lead to more sales. 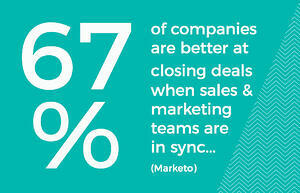 Just ask the research bods at Marketo and Reachforce who found that businesses are 67% better at closing deals when sales and marketing work together. So how do we get these two teams together…? Well locking them in a villa in Majorica for 6 weeks isn’t practical, so establishing an SLA between teams is a good start. Giving a shared responsibility over lead nurture and employing techniques such a lead scoring will also maximise resources. According to Marketingsherpa, 61% of b2b marketers send all leads directly to sales; however, only 27% of those leads are qualified. MADNESS!!! Handing leads over to sales when they haven‘t reached the ‘purchase’ stretch of their journey is like giving someone a diamond ring on the second date…they probably wont be ready. On the other hand, Gartner reports that up to 70% of sales leads are not properly leveraged or are completely ignored, thus wasting marketing program dollars. Marketing should be nurturing prospects and identifying them as MQLs (Marketing Qualified Leads) before handing them over to sales who can do some additional sales-focused nurturing; through which they can determine which should be labelled as an SQL (yep, you got it- Sales Qualified Lead). Both sales and marketing then have shared onus on guiding the customer to the required outcome, through end-to-end campaigns, delivering the right message, at the right time for the customer and maximising the likelihood of closing deals. In fact, “organisations with tightly aligned sales and marketing functions experience 36% higher customer retention rates and 38% higher sales win rates” according to MarketingProfs. 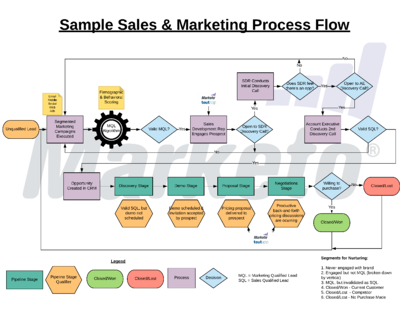 I cannot stress enough how important sales and marketing alignment is, but a definitive process or workflow is also required to ensure that the process is cyclical and leads don’t fall out of the funnel, but continue to be fed back in at various stages of their journey. This is highlighted nicely in this flowchart created by Alex Buckles at Marketo. Well the numbers speak for themselves…alignment needs to happen and businesses need to start making it a priority. If not, we’ll be looking at an even bigger made up number by 2020. Frightening. Right, I’ll grab Sales for ‘a chat’, you light some candles and stick on some Barry White and soon enough ‘Smarketing’ will be the new power couple. Oh hold that thought…”I’VE GOT A TEXT!”. To discuss how Sherpa can handle your marketing campaigns, align your sales & marketing and increase conversions by 140% please get in touch. Alternatively, if you just fancy a chat about Love Island…we’d be up for that too. Call us on 01234 964000.